It seems like every day people are finding themselves left with perfectly good dead bodies. Perhaps the body is a little bruised or has some stretch marks but otherwise it’s in great condition, all things considered. The normal alternatives are inadequate. Cremation? Yes, it’s affordable but entirely environmentally-unfriendly in the era of climate change. Burial? That’s at least $15,000 if done right. People feel obligated to come to the service, say nice things about people who may not have been nice, and then the body is buried semi-permanently, often on top of the bones of generations past. Do you really want to assist in making our world one big landfill of bodies? This is a new era: reduce, reuse, recycle. Don’t let your dead body be a liability on your balance sheet. It’s time to put it to use. If you’ve a lack of creative ideas, this first volume will get your creative juices flowing so you can find the solution that’s right for you. While the big lifestyle brands are focusing on centerpieces for your Thanksgiving table and reupholstering Grandma’s antique chair, this book offers real solutions for real people with real problems. After reading 101 Things To Do With A Dead Body, you’ll wonder, “How did I ever survive without this book?” With a snicker, you’ll realize that the other guy wasn’t so lucky…. The post <p style="text-align:center;font-weight:bold;"> This is a new era: reduce, reuse, recycle. Don’t let your dead body be a liability on your balance sheet. 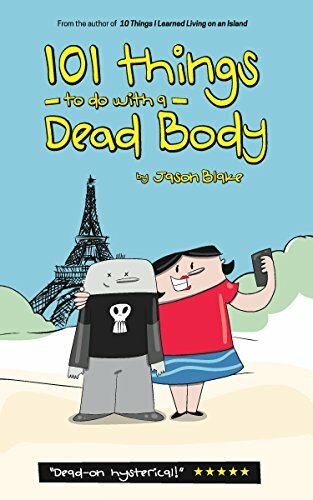 Jason Blake’s hilarious graphic novel <em>101 Things To Do With A Dead Body </em></p> appeared first on Kindle Fire on Kindle Nation Daily.